I haven't posted for a while. Work, the house, the garden and a holiday in Gdansk came first. 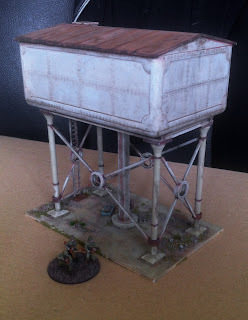 I've also been working on two model buildings. The first, a damaged town hall type-building, was a big project to start with but grew into a monster as it progressed. The second was a damaged apartment block that I've run into problems with. I've taken many photos of both projects over the last few months as they progressed but I'm not sure I can make sense of them now so I don't know if they'll ever see the light of day in this blog except, one day, as finished items. We shall see. I'm taking a break from them both at the moment so, meanwhile, here's a small project that I knew I could easily finish. It's a 00 scale water tower made by Dapol that's been in my loft for a while, and I wanted to make it suitable for my 15mm Chechen War table. I wasn't sure what to do with it for a long time but, after wandering around some of the former industrial areas of Gdansk, I was inspired to make it look neglected and put it on a base that looked like concrete slabs with grass growing between the cracks. I forgot to take pictures of the initial stages! The first thing I did was take my underused rotary tool and lightly grind away some of the plastic to make the tank look like it had taken some knocks over the years. The legs are intended to be painted as if they are iron but I liked the idea of them been made of concrete, the material of choice for Soviet-era builders, so I ground quite deeply into the legs in places to try and make it look like some chunks had fallen off them. After grinding, I smooth any hard edges with a file. I simultaneously used polystyrene cement to hold the strip to the plasticard disk and superglue to hold it to the washer. It wasn't difficult to do but I couldn't find anything to hold it all together so I ended up having to sit there with it between my fingers while I waited for the two glues to take hold. I then levelled the top of the disk with plaster. Why did I do it? I just thought adding a concrete moulding would make the pipe looked more 'finished' somehow and wanted to try out bending plasticard. I usually add flock or sand to bases, but I tried something different this time. Before gluing the kit to the base, I wanted to texture it by wearing down the plastic in a similar way to what I had done with the kit. I painted the plastic with polystryrene cement, poured fine sand all over it then rubbed the whole lot with sandpaper before the glue dried. It gave the smooth plastic a slightly rough finish that I think works quite well as an imitation of concrete. I was quite pleased with the finish and how easy it was to do so I roughened two more sheets of plasticard on both sides, to make a few generic concrete walls with later. If you try this method, do so in a well-ventilated area because it really, really stinks! Incidentally, I used a 25-year old bottle of Beatties own-label glue that I found in a toolbox. I never realised before but the smell is unlike any other polystyrene cement. I used this kind of glue on the first model kit I ever attempted (a Macross Valkyrie) so it brought back some pleasant but long-forgotten memories for me. I threw the kit's ladder into my box of bits because it was too large to use on a 15mm terrain piece. The replacement ladder is made by Plastruct. I added some sand to the base to camouflage that I cut the original base too small and added an extra piece. Oops. I scratchbuilt the scaffolding frame at the top of the ladder because I accidentally cut up the original pieces for another project. Oops. I also intended to put a wire mesh around the scaffold but I dropped the metal mesh on the floor and it didn't turn up until after I'd declared the project finished. Oops. The flocking on the sides of the base is not very subtle. I'm hoping it will look like clumps of grass growing up against the concrete slabs when it's on the table. A close-up of the grinding work I did with the rotary tool. It's just a few minutes of work but pays off because it makes painting easier. The thin washes of paint pool in the roughened areas and make it look like I've put in rather more effort than I actually did! A close-up of some of the grinding work on the legs. 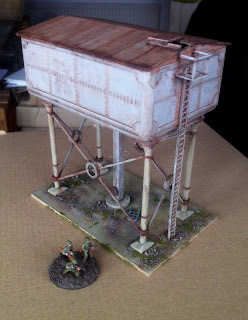 This is the end of the base that I extended after I put the ladder in position and realised I'd made it too short. 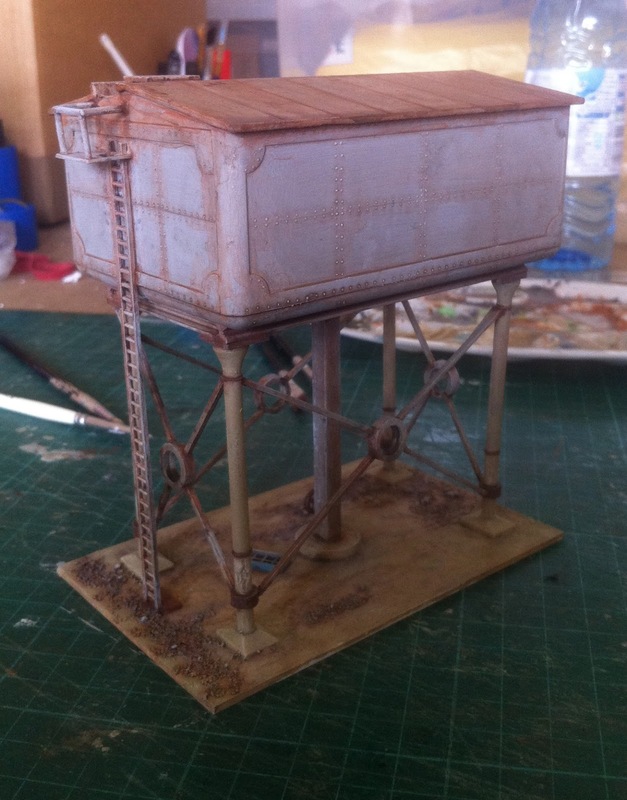 I did very little fine brushwork on this terrain piece. Most of it was drybrushing on the metal supports. I added some burnt orange highlights to the raw umber, and drybrushed the edges of the metalwork with light grey to pick out the details. I'm quite pleased with this project, not least because I finished it in a couple of evenings, which is amazingly fast by my standards, and most of that time was just waiting for the washes of paint to dry. 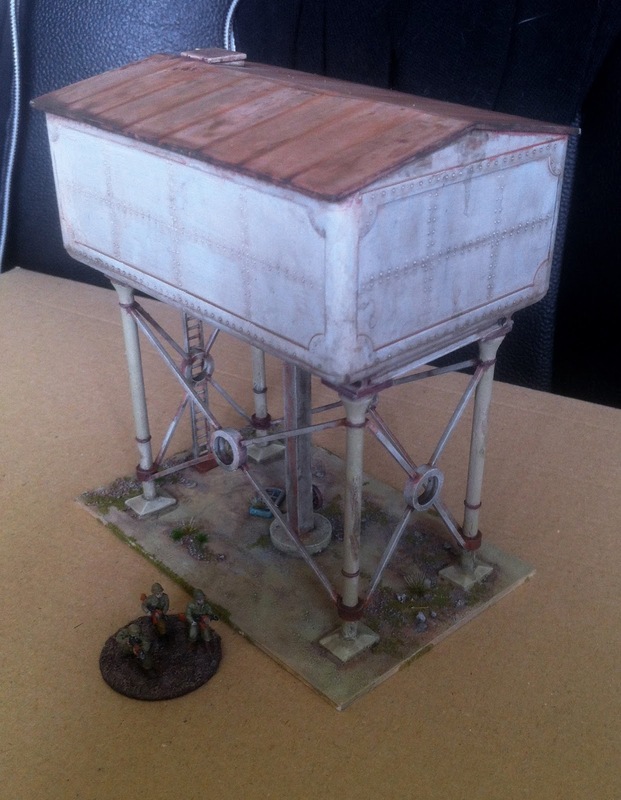 The paintwork doesn't stand up to close inspection but it will do for wargaming. 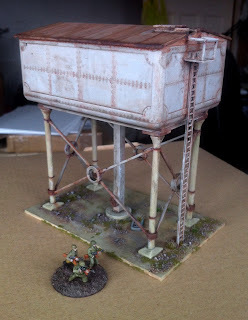 I'll be applying my new quick and lazy wash painting methods to future buildings.